In the centre of Galway City - follow one way system to Lr. Dominick Street and restaurant is on left. To be taken by full table. Rene Redzepi’s Noma Restaurant in Copenhagen has dazzled and inspired chefs as no other. It is to chefs what Dior’s post war “New Look’ was to Designers back then! Redzepi’s ethos is terroir based, matching foods with the natural elements surrounding them in the wild. At weekends the kitchen crew go out foraging together - foraging of the seashores and woods not just a run down to the local park or letting suppliers do the foraging for them. Anyway, what people want nowadays are different offerings by way of dining out. Small and funky, quirky and not overly expensive, the days of fine dining with fine white table cloths and flunkies have lost their lustre. Jp McMahon and Drigin Gaffey, are an equally inspirational couple and total foodies. 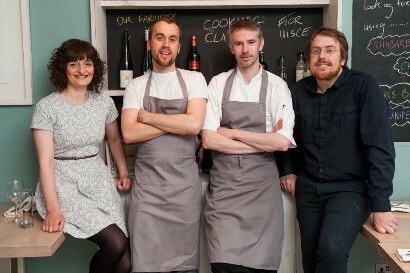 They opened their small fresh Aniar restaurant bringing their interpretation of this ethos to Ireland. They did it so well they were awarded a Michelin Star for their efforts - the only Michelin Star in the West of Ireland. It is a terroir based restaurant using only the freshest seasonal produce and they are foraging themselves. There is a lovely laid back feel to the place and there is something very innovative, pure and fresh and the way they handle and produce each dish. Aniar is all dickied out in cool aqua Nordic café colours and service is youthful fresh, knowledgeable and friendly. Five each starters, mains and puds, were on offer on our visit by way of an ultra hip staccato listing of each dish’s ingredients - not specifying that ‘oyster’ or ‘smoked potato’ might be by way of a foam or a sauce - as explained by our sweet waitress. Starters might include brown crab, mussel, cucumber, crème fraiche and rye, or sweetbreads, giroles, buttermilk and watercress. Alternatively crab might be with apple, celery and artichoke, or scallop with carrot, and belly whilst duck hearts are with hen egg and gorse. I had Scallop, oyster, dillisk,woodsorrel, smoked potato - three seared scallops entwined with wood sorrel set on dillisk bathed in an oyster foam, succeeding in imparting a delicious raw taste of the sea. Sir had pig’s cheek croquettes involving hazelnut, apple and cucumber - also pretty and delicious. Mains might might include ray wing, Russian kale, sea lettuce, cauliflower, mussel, or wild brill, little gem, broad bean, carrot and clam. Pork neck is with onion, turnip and leek. Venison is with sloe, beetroot and kale, whilst turbot has turnip top, mushroom and lardo. To follow I had pink tender tranches of lamb loin centred with a finger of crispy lamb belly, and turned ‘barrels’ of turnip, all on a ramson (wild garlic) puree, liberally scattered with green peas and landcress. Sir had a cracking sizeable, meltingly tender, braised beef cheek showered with beetroot ‘barrels’ and apple slices. mustard and sprigs of woodruff. He then had a heart stopping elderflower and gooseberry parfait enhanced with a deep honeycomb crisp, pink petals and strawberries, whilst I nibbled at dark rye crispbreads with four cheeses. Other desserts on our visit included raspberry, toast oats, whiskey cream, honey and sorrel, whilst buttermilk pannacotta, was with strawberry, rhubarb, and chamomile. To drink we had a 50cl carafe of Sauvignon Semillon 2008 and Montepulciano 2009 – I love being able to get these half litre carafes of wine – it gives great flexibility. They have over 40 wines from small artisan wine producers, and they have some twenty wines available by the glass. They also do a 5-course Tasting menu, which I think is great value which basically encompasses the sweetbreads, scallop, lamb loin, and elderflower and gooseberry parfait – Fabulous. The Tasting Menu must be taken by the full table – but great value and a great experience. Genuine enthusiasm, excellent innovative food at decent prices - and great buzz here.